Times of the Islands – Weaponry and Revenge! Wasps instigate a particular terror with their droning buzz, dangling legs, long abdomens equipped with powerful, repeat-fire weaponry, and a pair of sharpened pliers-like mandibles on their faces that can deliver wicked bites. Yet wasps do have important jobs to do, something about which most people don’t often think. 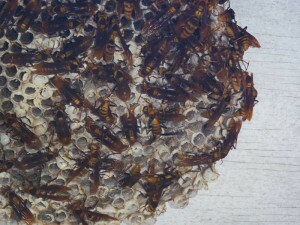 Paper wasps attend to the duties of the nest. 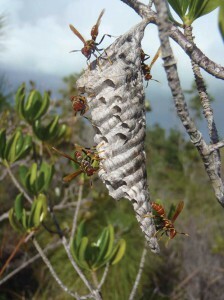 The most obvious wasps in the Turks & Caicos Islands are two species of paper wasps, which build elaborate honeycomb nests under protective overhangs. Such sites can be beneath palm fronds or even under small clusters of leaves and on the ceilings of rocky caves, but they are also frequently constructed in the protection of roof eaves on houses. This is usually what brings them into contact with people. The most common of TCI’s paper wasps is the humble Mexican paper-wasp Mischocyttarus mexicanus, locally known as the stinger-bee. This species is a social wasp, living in close-knit family groups (or “pails,” the plural term for wasps) comprising mainly non-reproductive female workers who are the daughters of a founding fertile female. The paper nest is built from chewed wood and glue-like saliva cemented onto an overhanging structure or tree branch, originating from a tough stem called a petiole with hexagonal cells built under it. The hexagon design of the cells fits together perfectly, and the cells can be lengthened as needed. Into each cell, the founding queen lays a single egg, which develops into a translucent pinkish larva. The larva is, like the adults, a carnivore—the queen will spend considerable hours of the day hunting for the favored prey of most wasps, which are caterpillars and other insects. However, a founding female has the odds stacked against her: 80% of new nests are destroyed by predators within twenty days of their construction. Jack-Spaniard wasps create large paper nest. While Mexican paper wasps are hesitant to attack unless their nest is directly disturbed, Jack-Spaniard paper wasps Polistes bahamensis are willing to launch unprovoked assaults on anyone just looking at their nest. These wasps have a similar life history to Mexican paper wasps, but they do everything bigger—they grow to two-to-three times the size of their smaller cousins, they build bigger nests with more cells, they catch larger prey, and they sting deeper and more painfully, usually while biting, too. They raise so many young primarily because they don’t live very long—it takes two months (and a lot of pre-chewed caterpillar baby food) for an egg to become an adult, but the adults only live about forty days. This may be why they are so aggressive—multiple generations have to raise the next generation, and also have to venture out to build new colonies (and smaller satellite nests). While paper wasps focus on quantity of young as their reproductive strategy, mason wasps focus on quality of housing. The mud dauber Sceliphron caementarium is a large, active, black and yellow wasp that collects balls of mud to construct what looks very much like a wad of grey toilet paper splattered up onto a ceiling. These potato-shaped mud forts are full of long chambers which the wasps stuff full of spiders that they have collected and stung. The sting paralyzes the spider, but does not kill it. Each chamber gets one egg laid in it, and then it is sealed. The wasp larva feeds voraciously on the live, paralyzed spiders until it is ready to develop into a full grown wasp and dig itself out of the mud nest, to fly off and begin building its own. Last year, I had the great fortune to have a mud dauber make her nest on a window behind closed shutters. I got to watch the entire building process from behind the safety of the glass. Not all mud wasps build their own mud hut—the blue mud dauber Chalybion californicum uses old mud dauber nests which have been vacated, and collects black widow spiders, which it actively hunts in their dark homes under rocks and in crevices. Blue mud daubers are large wasps with a metallic blue sheen and a habit of flashing their shiny wings as they gather mud to seal their recycled homes, but their conspicuous nature is all for show. Mud daubers, as a rule, are quite non-aggressive wasps, and they will pretty much ignore any person who is not outright destroying their nests. Even then, they deign to attack and sting. Of all the mason wasps, the award for artistry goes to the slender black and yellow potter wasps Eumenes sp. These finicky artisans gather soil (red Sahara silt only) and water separately, and mix it on-site. They lay the mud down in tiny droplets in a spiral formation, and create a tiny, squat clay pot, complete with narrow neck and flared mouth, in just about two hours. 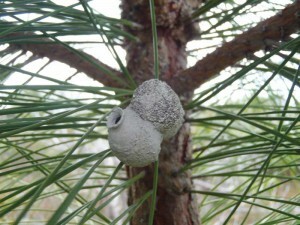 The female will then harvest caterpillars for over a week, and stuff them in the pot, stinging each one to paralyze it. After laying an egg and sealing the narrow top with a perfect plug, she will go on to build more little pots to fill. Not all wasps fly around crafting exquisite pottery or gigantic paper nests. Perhaps some of the strangest wasps are the fig wasps and parasitoid wasps. I must confess I have never seen either, but we know they’re here because of their evidence. Our native short-leaved fig Ficus citrifolia, like all fig species, depends on tiny, nearly microscopic wasps for pollination. A fig is sort of an inside-out floral structure, with hundreds of tiny flowers inside it. The tiny hole at the end of the fig is just large enough for a female wasp to lay her eggs in, and as the fig’s flowers develop, so do the wasp larvae. As the flowers bloom, wingless, wormlike male wasps emerge from their cocoons and search out females, often before the females even emerge. The males infiltrate the cocoons, mate with the females, and die. The females then emerge, push their way through the blooming flowers, and escape from the hole in the end of the fig. Dusted with pollen, they seek out another young, blooming fig in which to lay their own eggs. Just as gnat-like and tiny, the parasitoid wasps are quite beneficial to humans. They lay their eggs in or under the bodies of immobile scale insects, which are major plant pests. The larvae hatch and eat the scale insect’s soft body, then pupate and develop into an adult within the scale insect’s protective shell. Finally, they gnaw a hole in the shell and burst out of the scale insect’s exoskeleton, making sure it is dead. 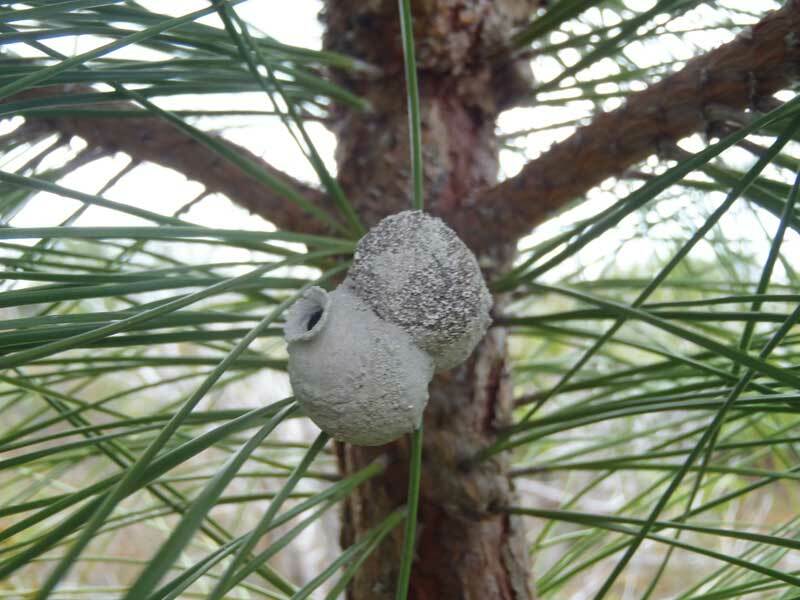 Recent evidence shows that there is a parasitoid wasp attacking the pine tortoise scale, which nearly caused the extinction of the Caicos pine, TCI’s national tree. With such a wonderfully sneaky ally, the Caicos pine has an improved chance for survival. The tiny fig and parasitoid wasps are far too small to bother humans, and both provide valuable services. All wasps do, really—they control insect populations. But with stingers and mandibles and sometimes unnecessarily aggressive attitudes, wasps really can be a nuisance to people. But they have their own enemies. Wasp moths have super-scent-sensing antennae, and a wasp moth can hone in on a large paper wasp nest in the darkest night, land and lay a few eggs, then fly off. The larvae of the wasp moth are ravenous predators, and they gobble down the defenseless developing wasp larvae inside their cells. Wasp moths are the reason why paper wasps will sometimes abandon a nest suddenly, and they are also the reason that founding queens will start several smaller satellite nests in proximity to their main nest. If wasp moth larvae are detected, a satellite nest becomes a way not to have all the larvae in one basket. If wasp moths are enough to scare away an entire colony from their nest, Cordyceps fungi must be the real stuff of nightmares for wasps. Cordyceps fungi, like all fungi, begin life as spores. In this case, if a spore lands on a wasp’s body, it begins to grow, and its mycelium fibers begin expanding through the wasp’s body and feed off of its fat reserves. When the fungus is ready, it then grows into the wasp’s brain, and terrifyingly, takes control—an alien pilot which flies the wasp upward to a twig high in the bush, then lands its insect plane and forces the wasp to clamp its mouth parts down and wrap its legs around the branch. The Cordyceps fungus then finishes the rest of the wasp’s body and blooms a series of tiny, threadlike, Y-shaped yellow mushrooms out of the wasp’s head and body. These mushrooms release spores, which float away on the wind, and the cycle begins again. The first time I encountered a Cordyceps-killed wasp corpse, it first fascinated me (I was familiar with them, having seen Sir David Attenborough’s extensive footage of their evil work), then it terrified me (“What happens if this stuff ever makes the leap to humans?”) and then it made me feel smug—take that, log full of yellow jackets.